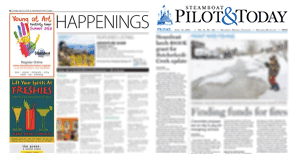 As citizens of Routt County and plaintiffs in the lawsuit against the county commissioners, we need to respond to the one-sided article that appeared in the Nov. 1 issue of the Steamboat Pilot & Today written by Matt Stensland. There is a backstory of facts that failed to be reported. It’s this biased journalism that we have become used to in Steamboat Springs, and the citizens need to know, as Paul Harvey used to say, the rest of the story. The county commissioners are not above the law. They knew that state statutes enacted into law by the Colorado Legislature did not allow Mystic Canyon Ranches interest abatement and chose to circumvent these laws. Like all elected officials, the commissioners took an oath to obey all laws as all elected officials are obligated to do. In this case they chose to “thumb their collective noses” at the law and, in short, ignored it. The treasurer is the only person that the Colorado Constitution empowers to collect and distribute taxes and interest. The commissioners lacked the authority to abate Mystic Canyon’s interest. These facts are indisputable. When confronted with these facts, the commissioners agreed to deny Mystic Canyon’s Abatement Petition but chose to do an end around the abatement statute by moving to refund the interest in question from the general fund. In effect, they just called Mystic Canyon’s Abatement Petition something else to dodge their lack of authority. What an arrogant move. Furthermore, to have Commissioner Corrigan refer to controlling Colorado law as “legal mumbo jumbo” proves he does not recognize the constraints that the legislature placed on the abatement or the limits of his office as commissioner. Even Commissioner Monger, when the treasurer’s legal counsel objected to motion as an end around the statutes commented “we understand that.” And yet the motion, made by Commissioner Hermacinski, passed unanimously. We find it troubling that Commissioner Hermacinski did not recuse herself from this hearing and find it even more atrocious that she made the motion, given the fact that Christy Belton, representing Mystic Canyon Ranch, is an outspoken, public supporter of her re-election campaign. Treasurer Britta Horn was vilified for spending county money on legal expenses. As taxpayers, we feel this is a very necessary expense to expose how Routt County operates (with a wink and a nod to avoid what the law requires) and ensure that all taxpayers are treated equally. None of this expense would have been incurred had the commissioners just followed the law. We applaud Treasurer Horn for her unwavering support in protecting the taxpayers of Routt County. If she did not pursue this action, a dangerous precedent could be set where anyone wanting a return of interest might have a case. Furthermore, this action opens the door for future end-runs around the law. It doesn’t matter if the amount is $5, $522 or $522,000. The law is the law. Lady Justice is supposed to be wearing a blindfold. The law doesn’t apply only when the commissioners agree with it or apply differently to politically connected taxpayers. This type of lawlessness must stop. We expect so much more from our county commissioners. Integrity and character should be on the top of the list. We challenge Steamboat Pilot & Today and any concerned citizen to read the filed court documents. They are public record. We think you will see the back story in all its detail. We encourage readers to do a little research, some critical thinking and arrive at your own conclusion as to who/what entities follow Colorado law, as they are entrusted to do.